Earlier this year, forum member Philliplucky thought, "I wonder what would happen if we all were using the same gear to catch fish?" After some online discussion, Phil soon set in motion a plan to hold the inaugural FTF Social Fishing Challenge on the 17th of March, 2012. The rules would be simple. 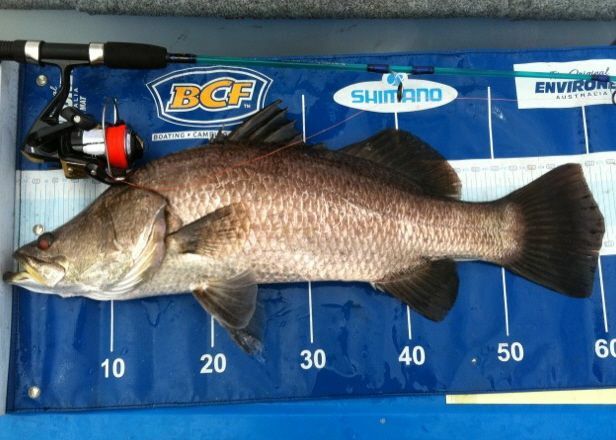 For a modest entry fee you would be issued with a rod and reel spooled with braid that would be more suited for children to use catching bream and whiting (a kiddie’s combo), not to throw bombers, flatz ratz, and assorted SP’s around the mangroves for 80cm barra! 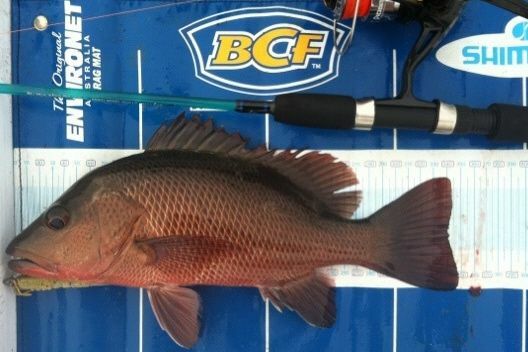 All fish eligible for entry would need to be of legal size, in season and photographed on a brag mat. 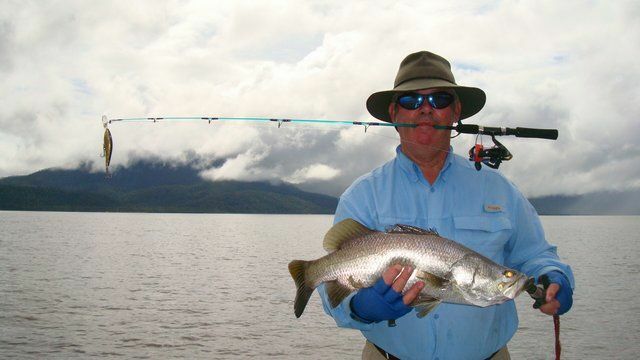 Hinchinbrook Island was the chosen location for fishing and the weigh in was to be held at the Lucinda Pub at 6pm sharp. Sounded easy, but mother nature has a way of upsetting things. We were soon heading across Missionary Bay with almost glassed out conditions as the tide was starting to recede from the mangroves. We hit the money spot and began to familiarize ourselves with the kiddie’s combos. Casting with the 4ft fiberglass rod was quite a challenge initially to say the least, but with each cast we were adjusting to the new equipment and it wasn’t long before “the pizza’s were getting delivered properly” (landing right at the front door, not at the letterbox!) Although we did spend a large percentage of our time hooked onto to fallen timber, hidden underwater roots and of course, branches 6ft in the air. We managed to sight, spook and be scared out of our pants by several barra, the largest of which exploded right beside the boat as we silently drifted right into her. Two hours later and still fishless, we made a move into one of the many creeks of Missionary Bay, only to result in more of the same, and it wasn’t long before we shot back across the bay and broke camp under the darkening sky and threat of an impending lunchtime downpour. 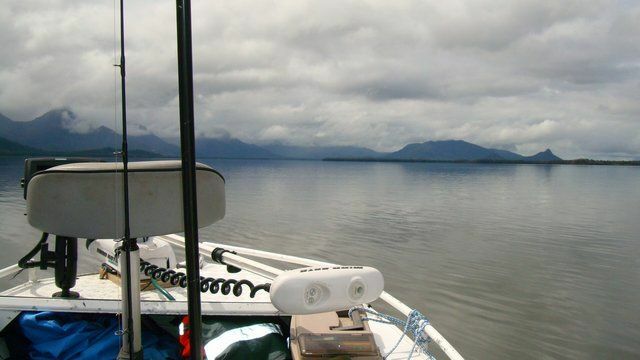 With the rain moving more south to Lucinda and not wanting to retire scoreless, we shot back to the boat ramp to unload some gear and then pointed the boat towards the infamous ‘Benjamin Flats’. 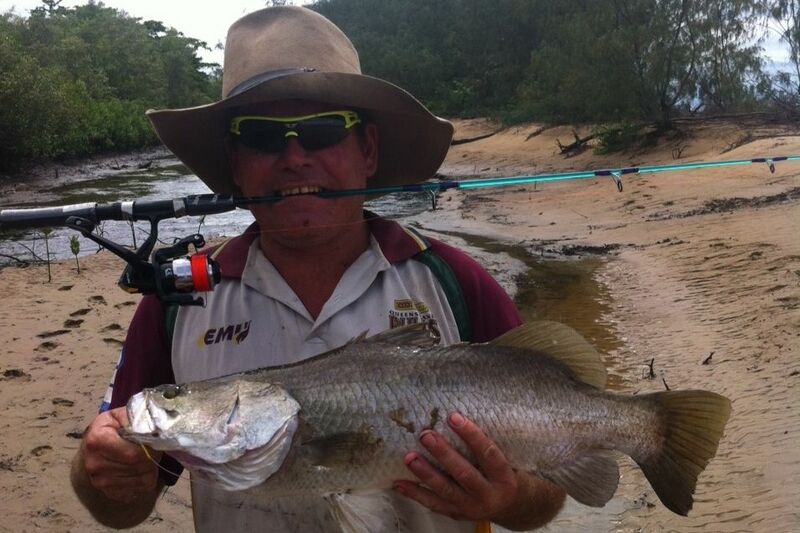 After a few more hours of fruitless casting to the mangroves, Rominus landed our only fish of the day, a 35cm barra which was mistakenly called for a bream as it was lead unceremoniously back to the boat. In the excitement of actually boating something, Rominus had forgotten to secure his lure and while striking a pose for one of the day’s only photos, put his left hoof down atop three brand new (and obviously sharp) trebles. Now, me being the caring, kind and nurturing type, I was too busy offering assistance and reassurance rather than using the cameras I had (one in each hand) to capture the moment for posterity and future comic relief. Both fish and angler were released unharmed. Two of the other boats (Team Bubba/Boof and Team Andrewgleeson/Huddy88) had intended to launch at Fishers Creek and concentrate their efforts around the middle part of the channel in search of barra, jacks and anything else that would pull hard enough to fuse the drag on the kiddies’ combos. 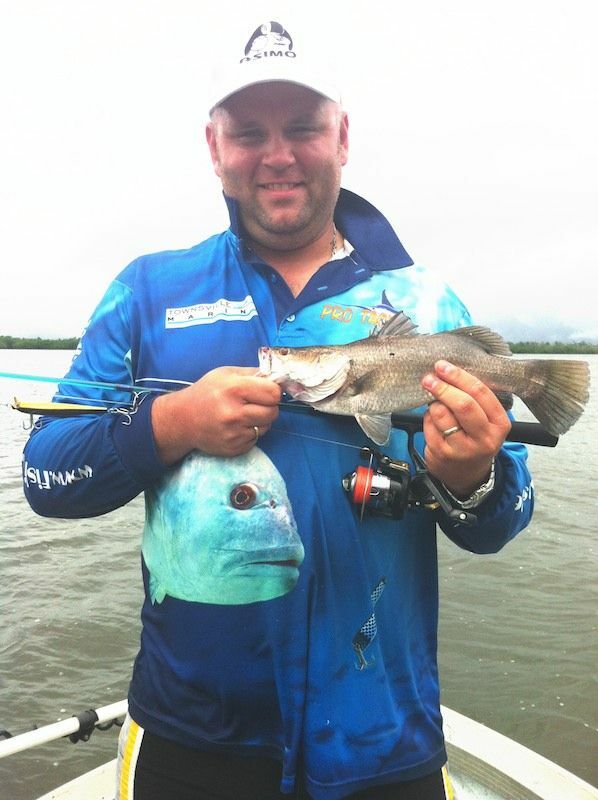 Andrew and Huddy88 did well to register two barra of legal size (60cm and 61cm) and a mangrove jack just long enough to qualify. The rest of their day was filled in catching several cod ranging from “newborn” to “wow” and a few others under sized barra and jacks. Team Bubba/Boof on the other hand, made the decision very soon after the first casts at the first snag that personal safety was foremost and the unfamiliar and unsafe fumbling with the kiddies’ combos desisted and the familiar and comfortable feel of graphite and ball bearings resumed. Unfortunately, as per the rules, this rendered any of the following haul of 6 barra caught and photographed unable to be entered into the competition. But according to Bubba and Boof, it was worth it. Now, while all this was happening, the last team of Philliplucky and Ben tried a very different and totally unconventional approach that ended up paying dividends. Cruising over towards the flats on the island side of the channel, Ben and Phil “claim” to have been ready to cast their lures at schooling bait on the sand flats one second, and then in the blink of an eye, they were stranded high and dry on the sand as the falling tide had disappeared quicker than a promise after an election. 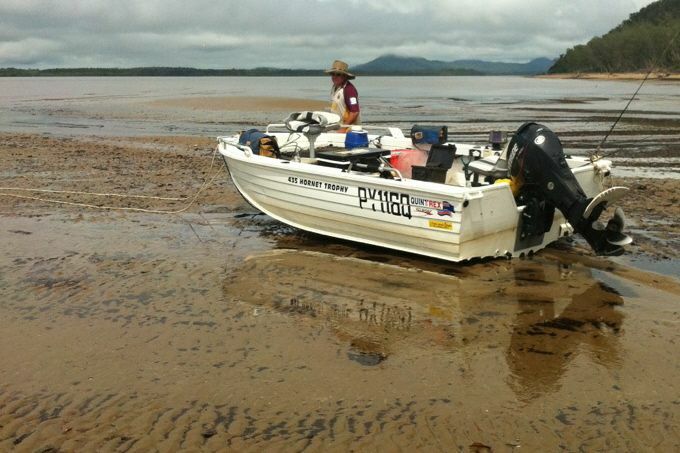 With only 3 beers on board and another 7 or so hours before the water returned, the boys were counting their blessings that they had been ‘beached’ and not ‘mud flatted’. With nothing but time on their hands, the boys explored over the flats towards the island and came across several pools left by the fleeing tide and freshwater runoff which were actually holding fish. A quick flick or two produced several strikes, follows and hook ups. At least now they had something to keep themselves amused. The best fish of the day (a 63cm barra) was extracted from a pool of water no bigger than a family sized car, over 3km’s away from the boat! I think that’s actually a classed as a land based capture. We all arrive at the Lucinda Pub just after 6pm and were met in the car park by the “Beach Boys” finally having waited out the tide and floated the boat form its daylong resting place only an hour previous. Bubba, Boof, Andrew and Huddy88 soon emerged from the Bar and joined in the group discussion and light hearted ribbing before one of the few passing showers for the day forced us all inside. Captures and techniques were discussed along with the obligatory tales of the ‘ones that got away’ and after everyone got their accommodation squared away, we sat down to a fantastic buffet meal and more stories of all things finned and watery. From me personally, and all who attended, and a big thank you goes out to Phil for putting in the time and effort to coordinate and execute what we all agreed was, in spite of the unpredictable weather, a fantastic opportunity to get together and do what we all love, having a fish and a yarn with a bunch of like minded anglers. Don’t miss the next one! !